Selling on Amazon platforms across mainland Europe is much easier than you think. It starts with Amazon’s integrated platform. You pay £25.00 a month to list products in DE, FR, IT, and ES. There are no additional costs for an increased number of listings. Logistics wise, Amazon’s European Fulfilment Network (EFN) allows you to send inventory to UK warehouses where it can be sold to the DE, FR, IT and ES marketplaces. If you experience rapid growth within Europe, consider Pan-European FBA, this handles product distribution in Europe from mainland Europe rather than the UK. This speeds up the delivery process and, as a result, sales growth can be much quicker. 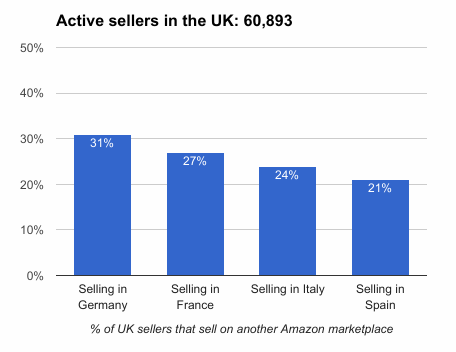 According to Ecommerce News Europe, most Amazon sellers in Europe sell in more than one marketplace. Warning: You need to register VAT in each country once you enable Pan-European FBA. Since there may not be exact terms for all English words, often automatic translations do not make sense. Check out this case where we corrected poorly translated copy. There are a many high profile blunders due to machine translation. For example, Clairol launched a curling iron called “Mist Stick.” In German, "mist” is slang for “manure.” This shows how important it is to invest in native translations whenever possible. Like all Amazon platforms, Sponsored Ads can work well for Amazon Europe. The return is generally good and it works the same way as in the UK, so there is no need to relearn the process. If you’re new to Sponsored Ads in Europe, below is an FAQ that will help you get started. Q: Which keyword tool do you recommend? 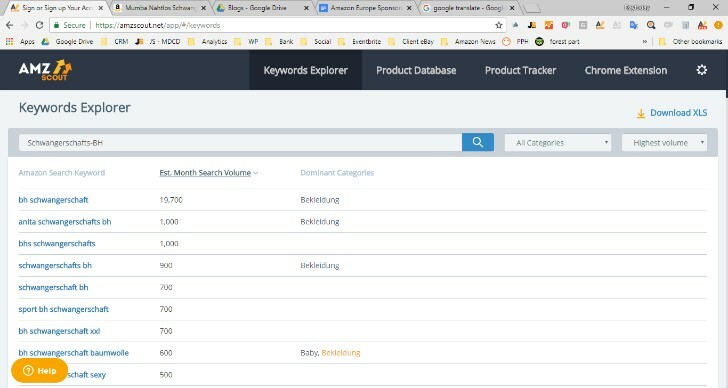 A: AMZScout Keyword Explorer is great place to start and comes highly recommended. Q: Should we use Amazon’s suggested bid? A: This is entirely up to you. Reviewing Amazon’s suggested bids is always a great way to find out keyword competition in desired niches. Q: Do Sponsored Ads improve organic rankings? A: Our findings would suggest yes, but this may not be the case for all sellers. If your product pages aren’t up to scratch or your price is too high, this will affect your rankings. It’s unlikely sponsored ads alone will help to improve. Q: If my products aren’t winning the Buy Box, what can I do? A: Use Repricer to ensure you are offering the best price. Alternatively, you can offer Prime or register your brand. All of these could increase your chances of winning the Buy Box. Q: Can I use Sponsored Ads even if I don’t sell on Amazon? 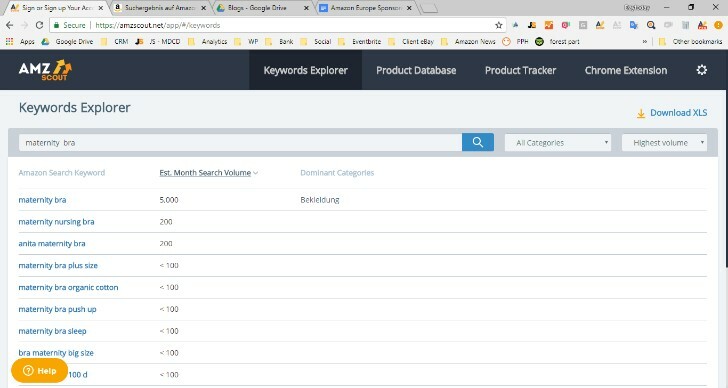 Q: How to find out which SKUs have sold through Sponsored Ads? A: Sponsored Products Purchased Products Report shows SKUs that have been sold via sponsored ads. This can be found in advertising reports. Q: Does Amazon display ads based on product details with Manual ads? A: Manual campaign ads are shown based on your keyword(s) and not the relevancy of your product content. Q: Does all product content get used for Automatic ads? A: Yes. When you run Automatic Ads, Amazon displays your ads based on the relevancy of your content. Even the hidden search terms become part of the targeted keywords. Q: Is there any way to find out orders that came through sponsored ads in Seller Central? A: Yes, if you use a pivot table in the Sponsored Products Purchased Report found in advertising reports, you will be able to determine orders that came through sponsored ads. Q: Is the lowest bid of EUR 0.05 a good way to start? A: Impressions will be limited with the lowest bid. There are two mindsets when it comes to bids: Starting low and increasing bids based on performance, or starting higher and decreasing bids based on performance. Both can be correct, depending on your business, but starting high will get quicker results. Q: Does Amazon punish you for having a low CTR (click through rate)? A: If you run an automatic campaign with a painfully low click through rate, your ads will show up with less and less frequency. Q: My products are already on the top of the search, should I still advertise? A: Yes. With sponsored ads, your products are shown on product detail pages, and many other places across Amazon, so it is still worth advertising. Q: How regularly should I monitor my ads? A: We would recommend monitoring campaigns weekly for the first 3 weeks and then fortnightly. You need to allow time for results and data to gather. Some businesses prefer to review on a daily basis, but it’s all up to the way your business wants to do it. Q: Do I bid for my brand name? A: Yes. Brand name bids are normally very low so it makes sense to pay. It also ensures you’re appearing for your brand name, and that competitors aren’t. This is especially true if they bid on it also. Q: Do I bid for my competitor’s brand name? A: Definitely. It is very common practice to do so. A: Bid+ allows Amazon to increase bids by 50% so you appear at the top of search results. Apart from the UK, DE is the only platform with this option available (in manual ads only). Q: Does Headline Search work the same on the European platform? A: Yes, it does. Brand registry is required separately in each country to be eligible for Headline Search Ads. Q: Is it worth paying for English search terms? Prabhat Shah is a Marketplace consultant helping online sellers expand their presence on Amazon. Prabhat has 10 years of experience and has worked with both UK and International businesses. To discuss more about how to grow your amazon business across borders schedule a call.